I just got an email from my day saying "lots has happened in the last few months, you should blog", and he's right. Though, I suspect he's the only person that reads my blog, and so this is a pointless exercise. However, using the headings he gave me in his email, here goes. 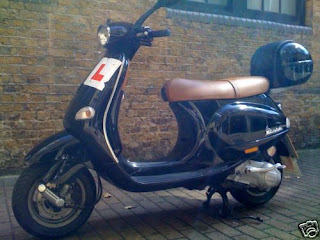 I bought a Vespa! I've wanted one for ages, and I kind of bought this one as a spur of the moment thing, without having passed my test of ever having ridden a scooter. So I bought it on ebay, then took my CBT, and picked it up on the way home. Since then I've ridden it into work a bunch of times, and left it at home in the snow and rain a lot more times. I'm sure I will ride it more when the winter ends! I've only had one drama - thought someone had nicked all my petrol but it turns out the bike fell over so all the petrol poured out. Damn. I've also bought a ridiculous amount of kit so far, including a jacket, gloves, two covers and two helmets. Now bugger off winter, so I can actually ride it! 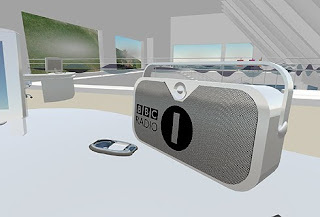 Back in September, I had a job interview with the hope of becoming Senior Content Producer at Radio 1 and 1Xtra. I didn't get it. But it turns out I didn't do so bad after all, because I was told in December that our other SCP was leaving and that I could have his job. Well, kinda. It's a BBC thing. So yeah, that's good. I started officially last week, and so far have been doing my old job as well because other people are on holiday. But the next few months look like they could be a bit different workwise. I'm not sure what Dad wanted me to write about Christmas. It was lovely, and was spent as usual in Loughborough and Nottingham with the two branches of my family. A noteable absence from the Loughborough leg was Gramma Gorman who couldn't make it due to a wobbly turn and bad snowy weather for driving. Santa got me a waterproof ipod, a new steering wheel for Billy, a new camera (yes another one), and a dazzling array of teeth-rotting delights. 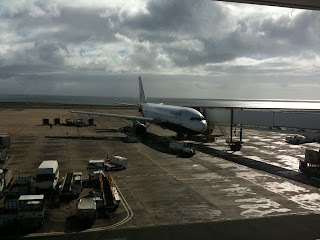 Freya and I decided to get away from the chilly UK for some winter sun and after much searching, opted for Lanzarote. It's popular for winter sun because it's only 4 hours away, same time zone as the UK, and is about 24-degrees at this time of year. Yum. £300 from teletext holidays. Far from being 'Lanzagrotty' it was really lovely. Yep there's plenty of egg-and-chips British and Irish bars, and if you didn't explore you could really get stuck in that and come away thinking it was sunny but naff. But we hired a car for just one day, and explored a lot of the island, which has every type of terrain you can think of, and some really gorgeous spots. We had a bit of drama getting home. I was so glad when we took off on time on Tues 5 Jan because it meant we would most likely land hours before winter gripped the South of England and close the airports. But with the plane just a minute off the ground and climbing, the air conditioners above the overhead lockers started spurting out smoke. This got lots of people panicking on the plane, with shouts of Smoke Smoke and Fire Fire (original huh?). Whilst the cabin crew came on the PA to explain it was just the warm air and cold air mixing, the Captain was less comfortable and decided to turn the plane around and land it back at Lanzarote. Balls. A wait, a bus, a wait, a hotel, a meal, a sleep, a bus next morning at 6am, a wait, check-in, another wait, some more waiting, and then a two hour wait on the plane finally led to us taking off at 2pm the next day. Because of snow, we were bound not for Gatwick but East Midlands Airport near our parents' houses. Not the end of the world, but still annoying enough for a small uprising to insist on getting their bags off the plane and staying put instead, hence the two hour delay on the runway. In the end, we had the last laugh because just as we approached it, Gatwick had re-opened. If we'd arrive any earlier or later, we wouldn't have got that window to land there, as they closed it again shortly afterwards. Just before we went on holiday, the boiler packed in. It's been a temperamental old thing for ages, and has usually responded well to a firm thump on the side of the cabinet. But before Christmas, the magic thump was no longer solving the problem. As we were not going to really be around for a couple of weeks we decided to leave it until after Lanzarote, and booked a plumber for the day we returned. But he got snowed in didn't he! So we were ruddy freezing for a lot longer than planned. Luckily we had electric heaters and immersion tank so it could've been a lot worse. And THEN, when the plumber did finally get here, he turned the boiler on and it worked first time!!!!!! I was so annoyed, as I'd been trying that every day just in case. There was nowt he could do really, he just packed up and left again - and was kind enough not to charge us a penny. But that evening, of course, it wasn't working again. 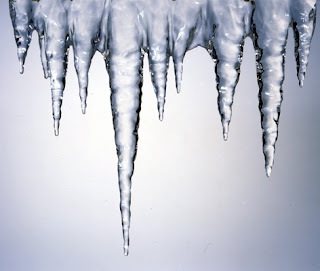 Icicles return. So I resolved to get to the bottom of it. OK here's the science. A motor, turns a fan, which blows air up a pipe, which pushes a diaphragm pressure switch, which sends an electrical signal saying it's therefore safe to let the gas flow and light the boiler. This wasn't happening. The fan was blowing, the pressure switch was switching, but there was no spark. 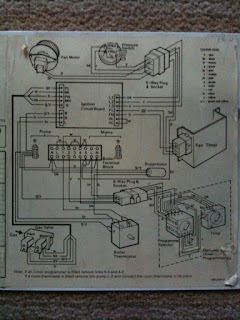 Having found a circuit diagram on the floor of the boiler cupboard, I traced the wires to the point where they join the circuit board and, erm... I gave them a little prod. Yep, thumping the boiler has been replaced with prodding the circuit board. Dad has a thing about how engineers used to carry rubber mallets or something, and I suppose all I've done is narrowed down my field of interferance from something 2 feet wide to something 2mm wide, but it did the track. There's clearly a lose or dry connection there, and it is now, for the time being, connected. Phew. Now don't report me to those Corgi's, because I'm sure I'm being naughty doing that, but I'm comfortable with the fact it's electrical not gas, and I've been very cautious and sensible. And I'm now warm, so whatcha gonna do about it? OK you're all up to date. Enjoy reading it, Dad!